It's been said that the only global carmaker Toyota is really worried about is Hyundai. This year, the legendary Prius hybrid—which celebrates its 20th anniversary—has some new competition. This is the 2017 Hyundai Ioniq. It's a hybrid, but there are actually three models of the Ioniq. 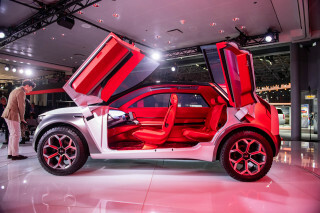 In addition to the hybrid, which will be the volume seller, there's a battery-electric version that has no gasoline engine at all. There's no Prius competitor for that, although at the end of 2017, there will be an Ioniq Plug-In hybrid that competes with the Prius Prime. We've now driven all three models of the 2017 Hyundai Ioniq, focusing on the conventional hybrid first. The Ioniq Hybrid Blue is EPA-rated at 58 mpg combined, marginally higher than the Prius Eco's 56 mpg. Other Ioniq Hybrids come in at 55 mpg, higher than the rest of the Prius range's 52 mpg. The new Ioniq is a dedicated design, meaning there’s no gasoline-only version. The high-tailed five-door hatchback is deliberately conventional in styling, to lure buyers who don't want to drive an unusual-looking car. In other words, the Ioniq is no Toyota Prius or Nissan Leaf—and it will likely pass unnoticed in traffic. The front seats are low but well-bolstered. 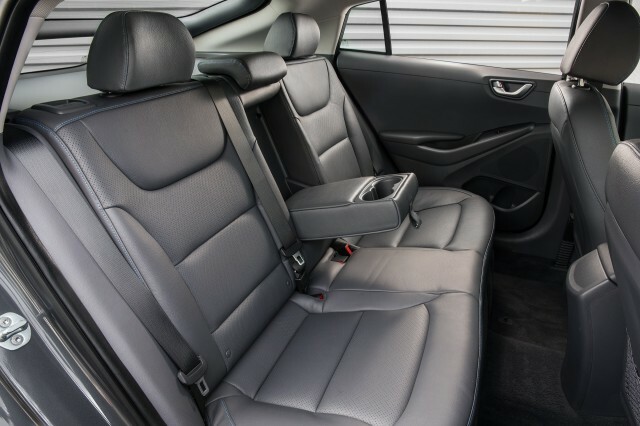 The rear seat holds two shorter adults with a little bargaining for legroom, or three in a pinch. But the Ioniq isn't a tall car. It has the same low seating position as Hyundai's Elantra compact sedan, but with the battery pack and gas tank under the rear seat. That reduces body height, and limits the rear-seat headroom to the point that even average-height adults will feel cramped. 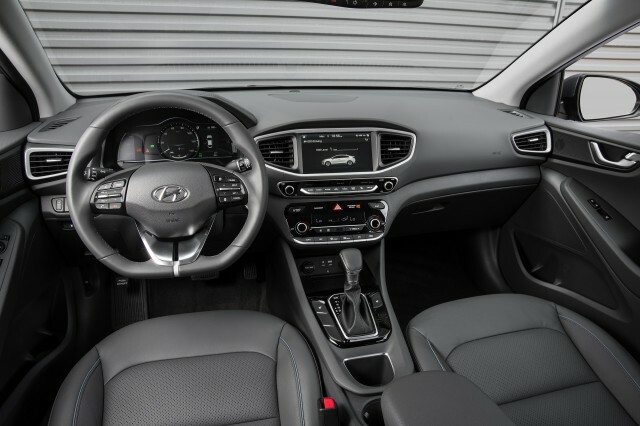 Interior surfaces include recycled or sustainable materials, but overall the interior is standard Hyundai—meaning straightforward and intuitive. Elantra drivers should feel right at home. 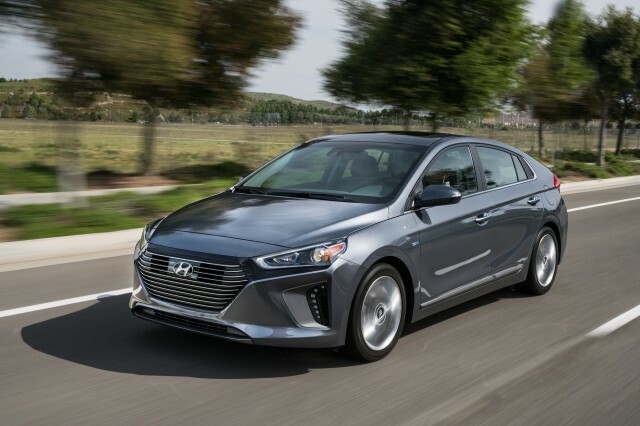 Hyundai stresses that the Ioniq was designed to be fun to drive, giving efficient transportation without compromising enjoyment. The hybrid is powered by a 1.6-liter 4-cylinder engine, with a single electric motor between the engine and a 6-speed dual-clutch automated transmission. The 1.6-kilowatt-hour battery gives the usual mile or so of all-electric range, under gentle acceleration at low speeds. The regenerative-brake blending is excellent, and the electric motor mostly buffers the quick shifts of the transmission well. The Ioniq Hybrid feels notably faster than the taller, heavier Kia Niro hybrid wagon that uses the same underpinnings and powertrain. Like the Niro, the Ioniq has a Sport mode that keeps the engine on all the time. Unlike the Niro, that mode didn't feel like a requirement to keep up with traffic. The Ioniq felt about average in handling and roadholding for small, low compact sedans. It's no Mazda or Volkswagen GTI, but neither is it numb or nerdy. 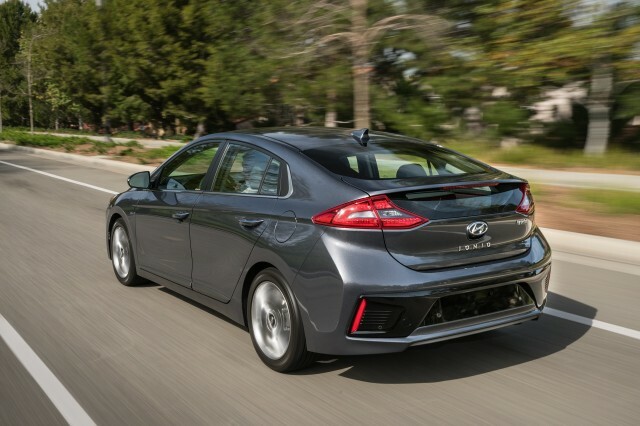 Hyundai expects the Ioniq to earn the highest safety ratings from both the NHTSA and IIHS. In the end, the Ioniq Hybrid is the stealth green car. It drives as "normally" as any hybrid we know of, and the design won't give it away. Think of it as an aggressively priced, very high fuel-efficiency car that no one will ever know is a hybrid—unless you tell them. So, after a full day and more than 100 miles in the three versions of the Hyundai Ioniq, what have we learned? 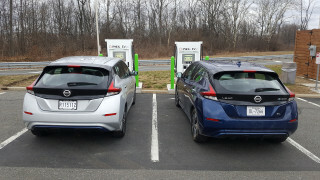 We've learned that it's an efficient five-door hatchback in any of its three versions, and that the different versions of the Ioniq—hybrid, electric, and the plug-in hybrid that'll come at the end of 2017—are good and efficient competitors in their segments, each against a slightly different variety of cars. Toyota's now built 10 million Priuses, but we wouldn't be surprised if Toyota were looking over its shoulder at this new dedicated hybrid that comes in three different versions: green, greener, and greenest.